Aside from a nuclear Iran, a serious new threat to the peace and security of Israel and the people of the epicenter is rapidly emerging — the prospect that the Palestinian leadership will unilaterally declare their own independent, sovereign state as early as the summer of 2011, and attempt to divide Jerusalem, and that the world will try to force Israel to accept this new state rather than require the Palestinians to sit down and negotiate a fair and just arrangement that both sides can accept. Make no mistake: a unilateral declaration by the Palestinians is not a recipe for peace. It is a recipe for war. Over 450,000 Israelis live in the West Bank. They are not going to quietly accept a Palestinian government in Ramallah deciding their fate. Nor will these Israeli settlers allow the Palestinian police to forcibly remove them from their villages, towns and cities. Especially Jerusalem. They will fight back. Israeli Prime Minister Benjamin Netanyahu would be under enormous domestic political pressure to back these Jewish citizens with the force of the Israeli military, and should violence intensify, he would likely order the IDF into battle. The results would not be pretty, and the Palestinian people would pay a heavy price. World leaders, therefore, should be putting enormous pressure on Palestinian leaders to sit down to direct negotiations with the Israelis and find a peaceful solution through diplomacy, lest violence result. Sadly, that’s not what is happening. Instead, world leaders are putting enormous pressure on Israeli leaders to cut a fast deal with the Palestinians or face the prospect of a Palestinian state being imposed upon them. “For behold, in those days and at that time, when I restore the fortunes of Judah and Jerusalem, I will gather all the nations and bring them to the Valley of Jehoshaphat ["the Lord judges"]. Then I will enter into judgment with them there on behalf of My people and My inheritance, Israel, whom they have scattered among the nations; and they have divided up My land.” (Joel 3:1-2). By the fall of 2010, several governments — including Brazil, Argentina, Bolivia, Uruguay and Turkey — had announced immediate or imminent recognition of a Palestinian state that hadn’t even been declared yet. Other countries are hinting that they, too, are ready to support the “unilateral option” soon. Top officials in the European Union, for example, are pushing an initiative for the E.U. to formally recognize an independent Palestinian state by the summer of 2011. Making matters worse, I believe it is increasingly possible that the Obama administration will also back such an initiative. Secretary of State Hillary Clinton said in November that she opposed a unilateral declaration by the Palestinians, noting, “We do not support unilateral steps by either party that could prejudge the outcome of such negotiations.” But given how aggressively the White House and State Department are pushing for a Palestinian state — and how poor relations between President Obama and Israeli Prime Minister Netanyahu have been in 2009 and 2010 — U.S. support for the “unilateral option” is a real and serious threat. Indeed, Members of Congress — both Democrats and Republicans — are so concerned that the Obama administration will support the “unilateral option” that on December 16th they voiced their opposition to such an approach. Such a unilateral move by the Palestinians, combined with widespread (and likely enthusiastic) international support would undermine six decades of attempts by the international community to reach a negotiated settlement of the Israeli-Palestinian conflict. Indeed, a unilaterally declared Palestinian state would violate U.N. Security Council Resolution 242, which calls for ”a peaceful and accepted settlement.” How could the settlement be “accepted” if it wasn’t negotiated and agreed upon by both sides? A unilateral declaration would also violate Resolution 242′s call for ”secure and recognized boundaries free from threats or acts of force.” How could the borders between Israel and the Palestinians be “secure and recognized” if they are not recognized by the Israelis? 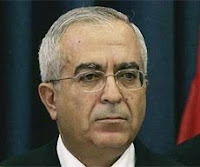 Palestinian Prime Minister Mahmoud Abbas and President Fayyad have been resisting true, reasonable, direct negotiations with Israel for months. They are simultaneously moving with confidence towards a unilateral declaration of their state and the division of Jerusalem. Why? Because they know they already have widespread international support. As noted above, French Foreign Minister Bernard Kouchner and Spanish Foreign Minister Miguel Moratinos announced in February 2010 that their two governments were likely to formally recognize an independent Palestinian state in pre-1967 borders within 18 months, regardless of whether Israelis and Palestinians reach a negotiated agreement. Moreover, Kouchner and Moratinos began urging the European Union as whole to recognize a Palestinian state by the summer of 2011. What would a new Palestinian state look like? For one thing, Prime Minister Abbas said it would be Jew-free. “We have frankly said, and always will say: If there is an independent Palestinian state with Jerusalem as its capital, we won’t agree to the presence of one Israeli in it,” Abbas told reporters in Ramallah on Christmas Day. For another thing, it would likely be divided between the Fatah-controlled West Bank and the Hamas-controlled Gaza Strip. Third, a sovereign Palestinian state would assert that it could have military and political alliances with Iran, Syria and other enemies of Israel, and should be allowed to import arms freely. This would put Israeli civilians in grave danger, especially since the absence of a peace treaty would mean the Palestinian people and leaders would have made no commitment to peaceful and secure borders. Jerusalem Post columnist Caroline Glick writes of two wars Israel will face in 2011 — a missile/rocket war with Hamas, and a political war over the “unilateral option” with Fatah. It is worth reading, and her conclusion is correct — Israel must win both wars decisively. Much is at stake. Let us continue to pray for the peace of Jerusalem, not the division of Jerusalem. Let us pray for the Lord to restrain the Palestinian leadership from making such a disastrous move, and pray that the Lord would restrain world leaders from encouraging the “unilateral option.” At the same time, we need to realize that eventually the land of Israel will be divided by the nations. The only true hope of peace and reconciliation is through the Prince of Peace, Jesus Christ, changing the hearts of Israelis and their neighbors and enemies and drawing them to Himself. Let us be praying, earnestly, therefore, that the God of Israel will shower His grace, love and mercy on all the people of the epicenter this year, that He will reveal His Word to them in real and powerful ways, and He will strengthen and grow His Church at this critical hour. 2009 — Palestinian President Salam Fayyed issues detailed plan to have a Palestinian state ready in two years. July 2009 — Javier Solana, E.U. Foreign Policy Chief, calls on the U.N. to recognize a Palestinian state by a certain deadline, even if negotiations break down. February 2010 – France and Spain indicate they are seriously considering formally recognizing an independent Palestinian state in pre-1967 border by the summer of 2011. April — Palestinian President Fayyad tells an Israeli newspaper that the Palestinian state will be ready to be born in 2011. December 4 — Brazil announces that it is formally recognizing an independent Palestinian state. December 6 — Turkey announces it will also soon formally recognize a Palestinian state. December 6 — Argentina announces it will formally recognize a Palestinian state. December 22 — Bolivia announces will formally recognize a Palestinian state. December 23 — Uruguay announces that it will formally recognize a Palestinian state.